If you are in matric and your future looks bleak because you have no money for further studies, don't give up hope. The Department of Water Affairs can help you brighten your future with a bursary. If you are interested in careers such as engineering, biochemistry and environmental sciences and if you love subjects like Maths, Science and Physics, you may find a future career with the Department of Water Affairs. The department has a learning academy where you can apply for a bursary to further your studies in these fields. They are offering bursaries for 2011 in over 30 fields of study. This is the study of water sources. Sanitation deals with the collection of waste from toilets and waste water in homes and communities and how it is treated and disposed of. This is the study of the Physics, Chemistry and Biology of inland waters such as rivers, dams and lakes. Using Geometry, Engineering, Trigonometry, Mathematics and Physics to study points and distances, as well as the angles between them. Such information is used to create maps and boundaries for government purposes. 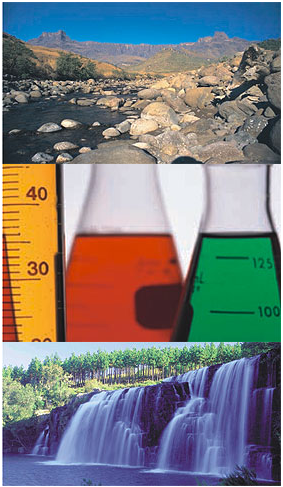 Geology is the science and study of the solid and liquid matter on earth. It focuses on the history and materials on earth, such as how they were made, formed and changed. It also focuses on climate change and environments. Geo-hydrology and Hydrology studies how water is distributed. Civil Engineering focuses on the design, construction and maintenance of bridges, roads, canals, dams, buildings etc. Electrical Engineering is the study of electricity and electronics. Mechanical Engineering uses Science and Physics to study the power and production of machines and tools. These fields focus on Chemistry, Physics and Science and how it affects and creates living organisms. These relate to the study of plant life using Science and Biology to examine soil and growing of seeds. The study of how social sciences, Physics, Biology and Geography affect humans, animals and other organisms. Environmental management focuses on managing and protecting the environment. Who qualifies for a bursary? To qualify, you must have an interest in Maths, Science or Biology with good grades in your matric exams. You can collect bursary application forms from the universities of Pretoria, KwaZulu-Natal, Free State, Cape Town, Stellenbosch, Western Cape and Limpopo, as well as the Nelson Mandela Metropolitan University, the Walter Sisulu University and the Tshwane, Durban and Central universities of technology.